LEGO Disney Princess Cinderella's Dream Castle Building Kit DEAL! Home Amazon LEGO Disney Princess Cinderella’s Dream Castle Building Kit LOWEST price! LEGO Disney Princess Cinderella’s Dream Castle Building Kit LOWEST price! How cool is this LEGO Disney Castle? 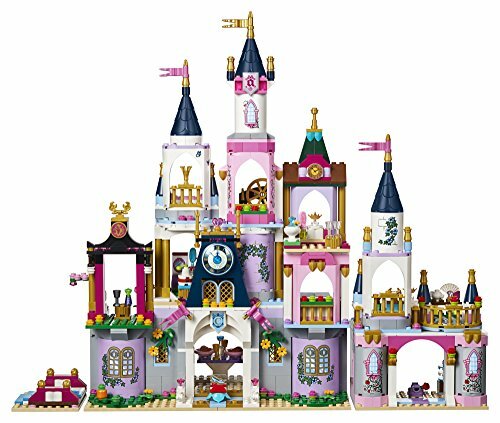 Hurry and get the LEGO Disney Princess Cinderella’s Dream Castle 41154 Building Kit (585 Piece) today for only $55.99 from Amazon! This is the best price ever on Amazon. Limit 2. Lego Disney Cinderella dream castle is the ultimate set to play out your fairytales, whether recreating scenes from Disney Cinderella or creating new stories of your own. With a grand dining room, bedroom, dressing area, kitchen, fireplace and balcony, theres so much to explore and hidden secrets to discover in this popular toy for kids. Get creative using the modular design to easily move and swap sections within the model, or rearrange the rooms of the castle and integrate them with other compatible LEGO Disney toys to build your own dream creations. Includes 2 mini-doll figures plus a foal and 2 mice figures. Buy the LEGO Disney Princess Cinderella’s Dream Castle 41154 Building Kit (585 Piece) from Amazon. Previous articleLEGO Star Wars Ahch-To Island Training 75200 – Low Price Alert!